I love everything about this cake. I love the colors, the heart, the envelope, and the concept behind it. Reason why there’s a ring in between the roses is because this was an engagement cake. Even though the story is a bit sad, the movie is really uplifting as throughout his notes he encourages her to move forward in her life, find her passion once again and fall in love all over again. P.S. I love you becomes a really good reminder of not to take anything for granted in life. The red rose is an unmistakable expression of love in its entirety. There is also a meaning behind the amount of nine roses on the cake. A flower’s meaning is not specific to its colour and type alone, but also, to the number of flowers you choose. Nine is a symbol of eternal love. You would often give this exact number of roses to those you wish to spend the rest of life with. The heart shape is the universal symbol of romantic love. Hearts symbolizes unity, cohesion adoration, femininity, soul connection, sexuality, courage and so much more. This symbol was already established as a symbol of love in the 19th century, but is most commonly used in this era thru social media. Utilizing emojis that express admiration or adoration for something or someone. The belt motif relates to a general bond that can be understood as an unbreakable unity and strength. It also means loyalty, forever and love. There are 4 belts in the upper tier. The number four symbolizes the safety and security of the home, the need for stability and a solid foundation of values and beliefs. The ring is another symbol of love. It’s made in a circle that has no beginning or end and is therefore a symbol of infinity. It is endless, eternal; just the way love should be. Many people think the origin of this custom stems from an ancient Roman belief that a vein travels directly from the left ring finger to the heart. As we already know, the heart is a symbol for true love. The color black can have good and bad connotations. This one is used to express the meaning of strength, protection, comfort, seductive, formality and elegance. The red means passion, seduction, desire and love. 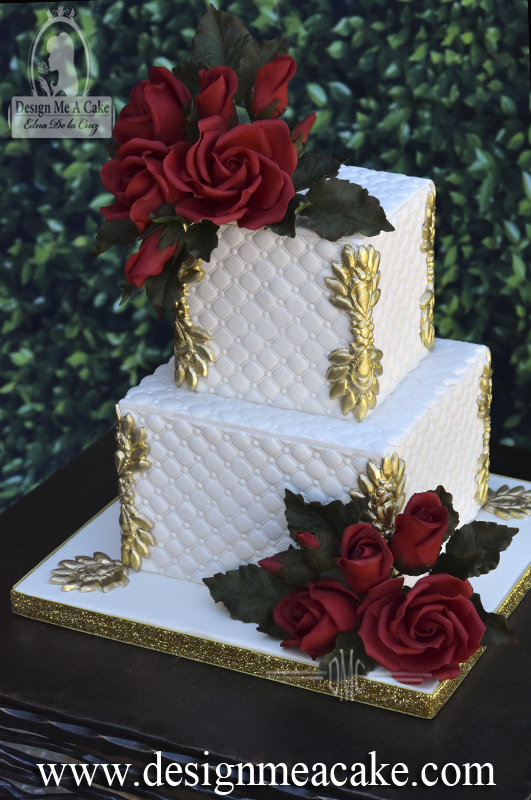 Not all cakes have a symbol for each motif or item placed on the cake. 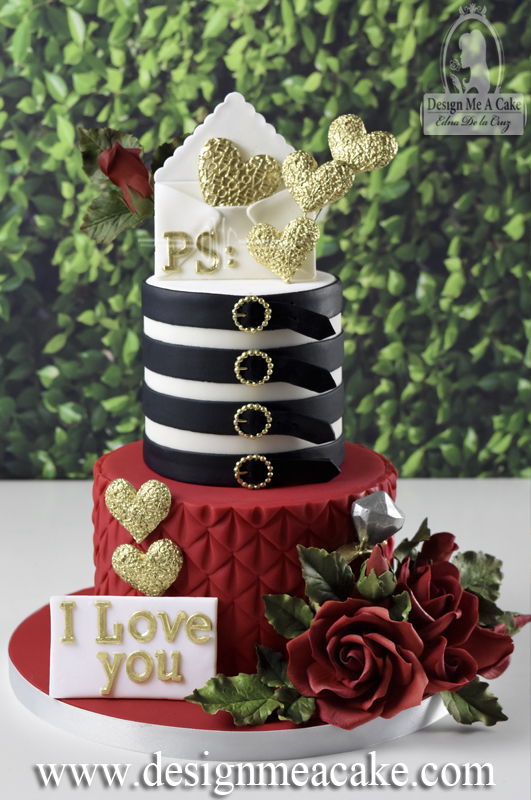 Most people just do a cake that they find beautiful to their taste or will match their decor, but some people make sure that their emotions come across in the most subtle ways to ensure that their other halves know how they feel. 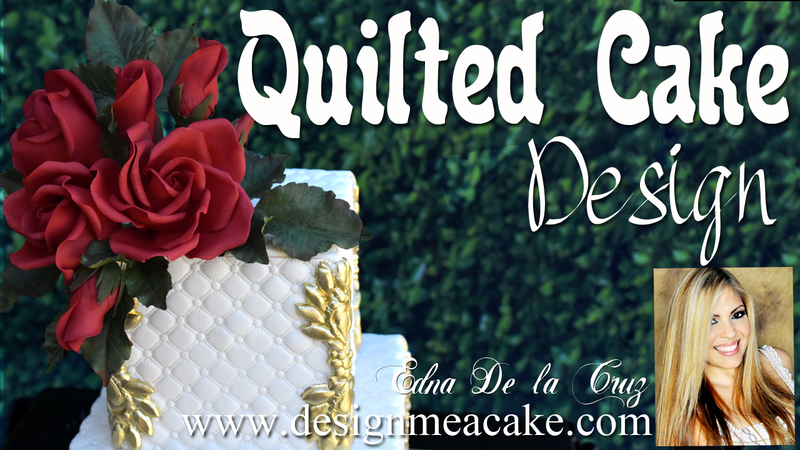 I filmed a tutorial on this cake and I am posting the links for the materials I used on this cake below( scroll down to check them). Click here to see the tutorial or on the photo below. I hope you enjoy the tutorial and this Blog. *Not all products are promoted in this blog; just a few. I do love all the products I used and that’s why I mention them, and earnings are used in making new tutorials. Thanks for the support! Click here for lettering mold used in this tutorial. 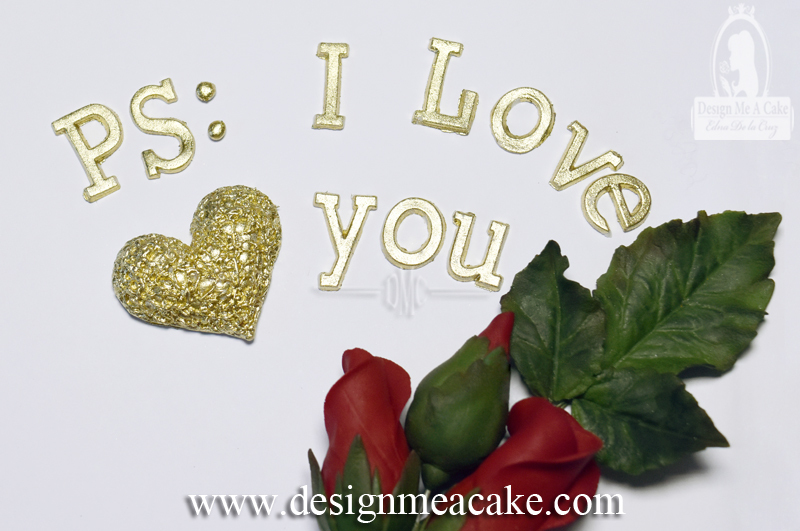 Click here for tutorial on this lettering mold. I grew up with a Guava tree in the backyard of our house. It made me a guava lover. This is a very common filling in baking and it’s pretty easy to do. I have a hard time finding the fruit where I live now but I can find the guava paste easily in the Hispanic section of most supermarkets. It’s also easily found in the internet. I will post some links below. Sometimes you will find the jam but I find it too soft for cakes. Even though you can still use the jam in a cake, I do prefer a thicker consistency which provides a less slippery cake. This is something important that you need to consider when you’re stacking a cake. I always tell people that if they are using jams as fillings, they have to make sure not to overfill the cake and use a dam. Usually jams have a lot of flavor and a little goes a long way. If you want to have more filling, you can always add more layers to the cake instead of trying to pack a lot of filling the same layer and making everything slippery and hard to work with. I love using guava paste. You can control how thick or thin you want the filling to be and fix the consistency at any time. You can do this with a food processor, in the stove or the microwave. I do get lazy sometimes and use the microwave, mostly because it works fast. But the other options work well too, especially if you don’t use microwaves or if you don’t own a food processor. I do go through all the steps in the tutorial I posted, (click here for tutorial). I know some people love to add orange juice as the thinning agent. I personally don’t use it. 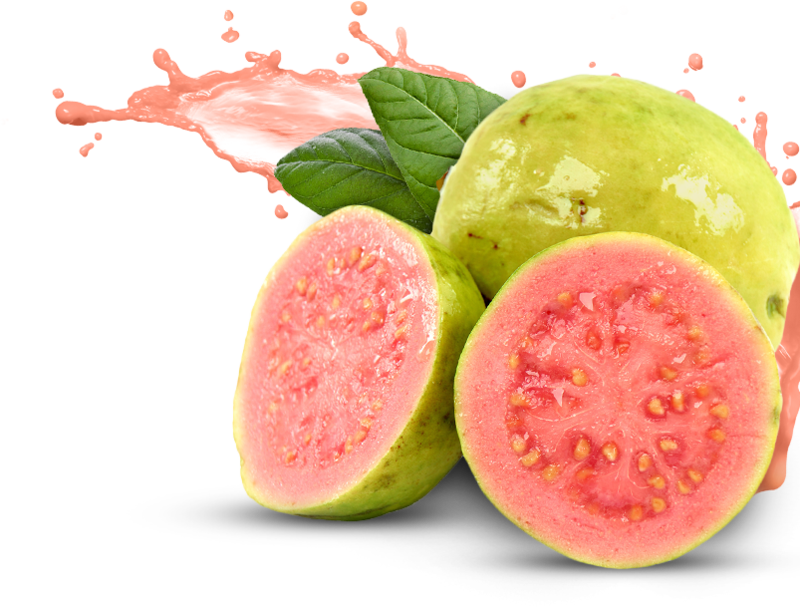 I feel the guava tastes delicious without adding other flavors but if you like the idea, then go ahead and try it. Some people also like using lemon and others like adding some of the zest of the fruit they are using. I posted a basic recipe in the website. Even if you prefer using the fruit, keep in mind that you can thin the recipe more if you prefer a thinner consistency just by adding some warm water. If you want a thick consistency, you can warm the paste and add it warm to the cake. This is a matter of preference and that’s why I am giving you the options so you can choose the one you prefer. Do keep in mind that if you plan to use it on top of an iced cake, if the paste is too warm, it will melt the buttercream. Since I love a medium/thick texture on top of the buttercream, I do warm it a little but not too much. I also make sure that my buttercream is cold. I won’t lie, it’s a bit harder to ice a cake with the thicker paste over buttercream, especially if it’s too hot. So make sure it has a medium consistency so it’s easier to spread. If you already placed it on the cake and it’s giving you a hard time because it’s too thick, you can place the spatula in hot water. Once the spatula is hot, dry it with some paper and this will help smooth out the paste. If this doesn’t help you, then you can take some of the leftover paste recipe and thin it a bit with more water and then add it on top of the thicker paste. This will help you smooth everything out. You can test all of these techniques but, if you prefer to avoid the trouble, adding the guava on top of the buttercream is just done for looks. You will get enough guava flavor by just adding it as a filling. Then again, people like me love guava that much. I never mind the extra guava flavor! Lol!!! Check the tutorial for the Guava Filling Recipe. Click here or on the photo for the step by step tutorial. I am posting below links for recipes you can use with this filling. I hope you enjoy the tutorial and the recipe. This is the paste I used in the video. This is a delicious paste. I used it many times! Guava Jam is a bit more runny but it can be used. Condensed Milk Buttercream it’s super easy. Cream Cheese Buttercream goes great with this filling. Click here to check this recipe and tutorial. Moist White Cake Recipe pairs well with fruit fillings. Click here to check this recipe tutorial. For those who can eat eggs, this is a delicious cake! tutorials for basic cake techniques. Learn to pipe shells with this tutorial. Years ago I was designing a cake for a bride and somehow we came to the conclusion that she wanted to have the topper fully as a dummy so she could save it and use it for her first year anniversary celebration cake. These days I mention this idea to all my brides just so that they know that this is an option available to them to do for their cakes. I love making toppers that I know will be saved and will keep the memory of that special event. It’s a great way to save something from the event and use it with a fresh cake if they want to. The topper can be saved in a box or even under glass, if you want to save it from getting dusty so you can reuse it. If you prefer, you can display it in your house as long as you protect it from heat and light. The light will make the colors fade and the heat might soften the gumpaste details, so I prefer to keep it in a cold and dry area and away from sunlight or UV lights. With proper care a sugar piece should last for many years. I still have a topper I made from a class I taught years ago and it’s still in great condition. Of course it won’t last forever, but if you lightly dust it, it should last for a very long time. Having the option of saving a topper is something that brides love. 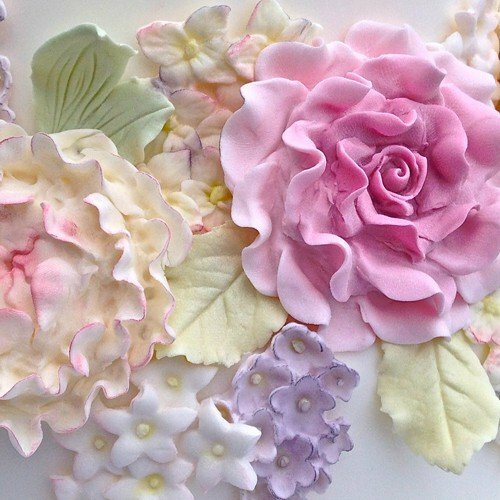 Especially when it comes to using gumpaste flowers. When they have the option of saving the item for a longer period, they feel better about investing on what is ultimately a work of art. I do make sure to tell them to be careful when moving the piece and cleaning it since gumpaste is delicate. I made a tutorial on how I did the base of this cake. 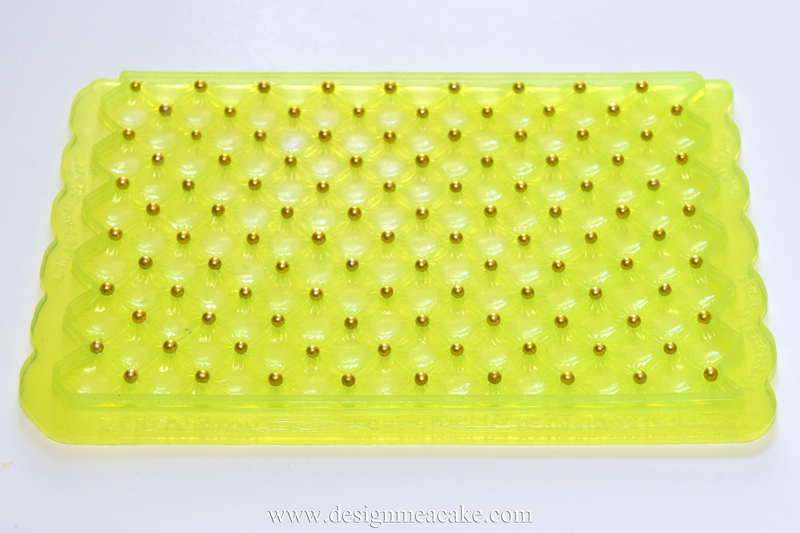 I wanted this base to look like a modern style basket weave, so I decided to use this beautiful mold from Marvelous Molds for my base. 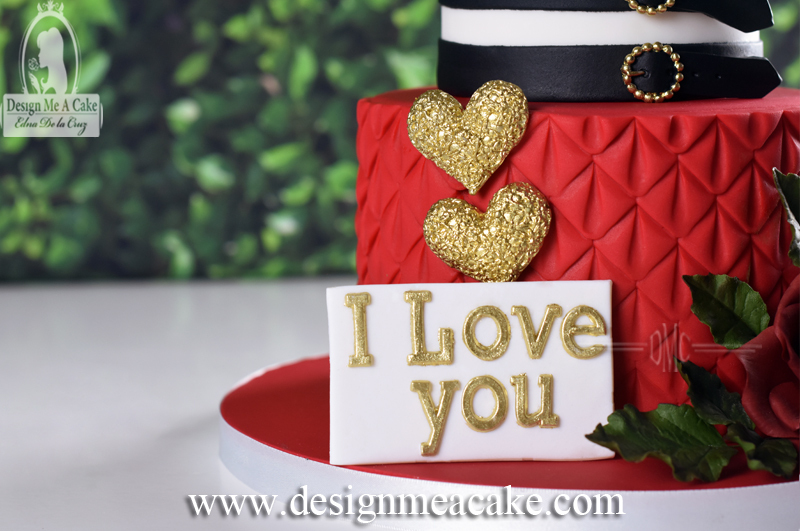 The tutorial shows how to use basic molds in unusual cake shapes. I basically divided my cake into panels and added other details to complete and clean the final design. I love the combination of the black and Copper Petal Dust for this fall theme topper. Once you achieve your base, you can finish the topper with any flowers you want. You can do this type of base on real cake or on a dummy. I used a 6 inch dummy that had a V shape but I have also made this topper using a 4 inch dummy. This is another way to give height to a cake for a bride that is having a small wedding but wants a taller cake that makes a bolder statement. 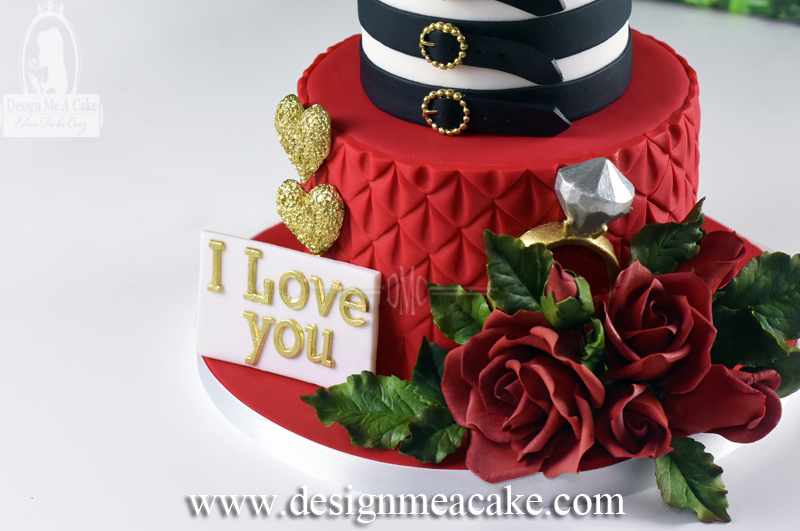 I will post the links for the materials used in this cake below for those who are interested in them. Click to watch the tutorial. I hope you enjoy this tutorial. Until next Blog, ta ta! This is a frame mold from the Celcraft company. years and still love it. petal dust. 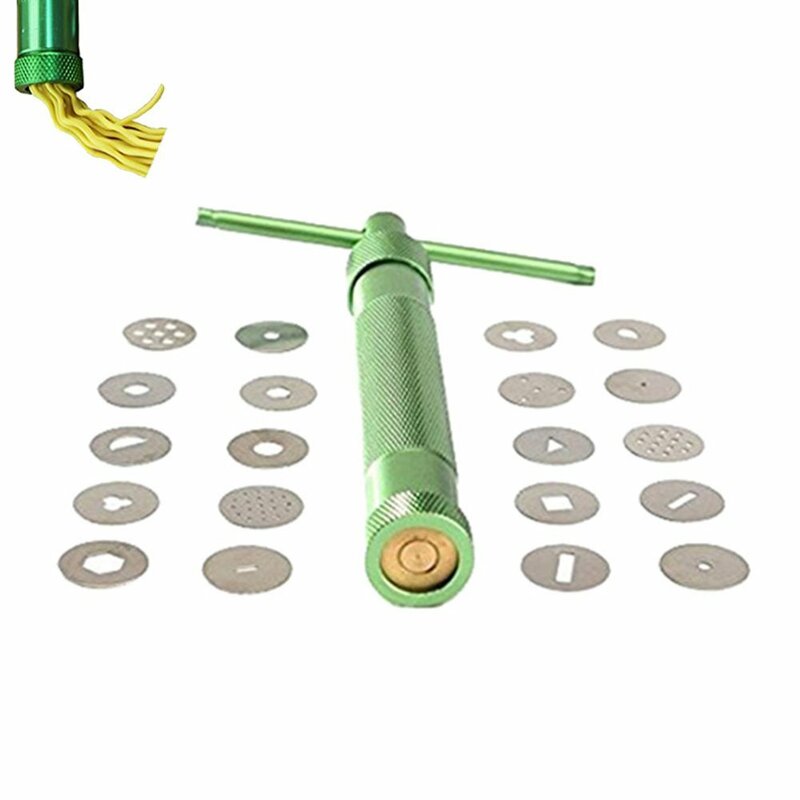 I have this product available in my website. to hide the seams or borders. with special shapes for your cakes. with these easy to follow tutorials. I love chocolate! And honestly, who doesn’t love to eat Oreo cookies? So whoever thought of putting them on cake deserves an award. In my last Blog I posted my favorite Chocolate Cake recipe so I decided to follow that with this delicious cake recipe. I remember many years ago when I moved to Florida, I went to my local supermarket and they had a cookies & cream cake. At that time I was not into cake making but definitely into cake eating, so I had to try that cake. I must say that I thought it was delicious. The buttercream they used in that cake was like Bettercreme, (check my tutorial on this). They crushed the cookies into the Bettercreme and filled all the layers with this mixture, and then they covered the outside of the cake in the same icing/filling. With time my cake taste has developed. As much as I liked that cake back then, I knew it could get even better. The recipe I used for the filling in this cake is super tasty. Instead of Bettercream, I used cream cheese and butter and it just takes the flavor to another level. I love the recipe how it is but if you want something lighter, you can always add a cup of to the recipe. 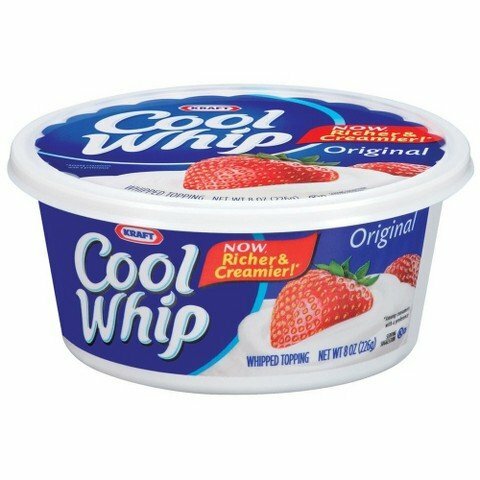 Another option is to add a tub of Cool Whip or make your own stabilized whipped cream and add it to the recipe. Keep in mind that once you add the dairy into the mix you will need to keep the cake in the fridge. As many of you already know, I don’t like cold cake. I feel it loses flavor. You can finish this cake with your favorite buttercream recipe. If you want something light, you can use Bettercream or Stabilized whipped cream. If you want delicious with a smooth finish, I suggest using my Cream Cheese Buttercream. This is a bakery style cake and is not about a perfect finish but it’s all about a delicious cake. To finish this cake, I added Oreo cookies all around the bottom of the cake. This is a personal choice. But surely, who complains about eating more cookies..lol I do prefer using the thin Oreos when I am making the cake but you can use the regular ones just as well. I topped the cake with some old fashion Ganache. I love Ganache and I know that it has dairy but it will keep well out of the fridge for a few days. Plus it makes it really creamy and delicious. If you can’t have dairy, you try making it with water instead. My other suggestion is using coconut milk. For decorating the cake you can use anything. I decided to go all out and use Pocky Sticks flavored in cookies and cream, a bar of Hershey’s Cookies ‘n’ Cream and (are you ready for it? ), more Oreos. Click here to watch tutorial. Here are the the links for the products and tutorials I used. Last Blog I was talking about the difference between “Natural” and “Dutch Processed” cocoa. If you missed that post, I would suggest you read it because it can make a difference in the outcome of your chocolate cakes. In this Blog I will be talking about one of my favorite chocolate cake recipes. When I first opened my website I had a Stout Chocolate recipe posted in there. I love that cake recipe. It’s a strong cake and almost tastes like a brownie. But not everyone wants to add beer to their cake and I can understand that. The alcohol in the recipe is baked away so there’s really no alcohol left in the cake but some people just don’t care to deal with it. Knowing this I have been meaning to post other chocolate recipes I love but between moving the website a couple of times and all the work I had, I just didn’t have enough time to sit and do a tutorial as I wanted. I can say that I finally took the time to do the tutorial and post it in the website. YAY! This is a very old recipe but it has a few changes from the original recipe that in my opinion makes it taste even better. It makes a very moist cake and it’s super easy. The batter is a bit liquid and I am sure most people are not used to batters like that, but it works great. I use unflavored coconut oil for the recipe to make it healthier but you can use canola oil or vegetable oil instead if you prefer. The recipe has never failed me but you can always decrease the baking soda by half a teaspoon if your cake sinks slightly in the center. Also keep in mind that depending on the cocoa you use the finished product could be different . I talked about this in my previous Blog. I tried the recipe using Hershey’s Natural and Hershey’s Super Dark and I will say that I didn’t love the one with the Hershey’s Natural, but the one I made with Hershey’s Special Dark was really good. So if you are not in the mood to order high end cocoa for your cake, feel free to test it with the Hershey’s Special Dark. If you use your regular cocoa and it doesn’t turn out moist or with a a good crumb, make sure to try again but change your choice of cocoa this time. I assure you the cake is worth the try. I have used this recipe for many years with success. I will be working next on a tutorial for cookies and cream cake. 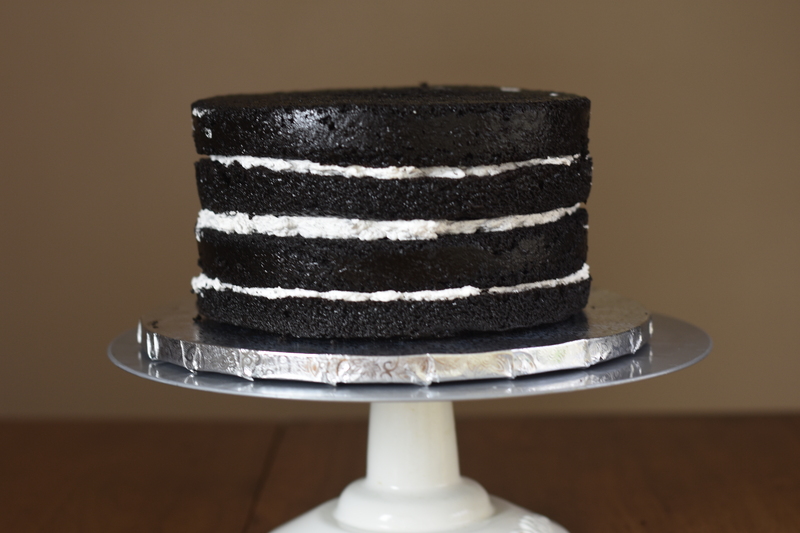 So if you are an Oreo lover then you will love the next cake recipe post. But for now, click here for the link to the Chocolate Cake Recipe and Click here for the Chocolate Buttercream Recipe. Click to go watch tutorial and get recipe. I hope you enjoy this Blog, until next one.. Ta ta! We all love chocolate and we each have our favorites when it comes to flavor. We all see recipes everywhere for cakes. And not everybody in the world is a chef and knows the difference between chocolates. Most of the time a regular person will see a recipe and go to the supermarket to buy the first cocoa they can find. Some people don’t even notice or think much about a recipe that is asking for dutch process or natural cocoa. All they see is unsweetened cocoa and that’s the one they will invariably go for. I myself didn’t know much about the differences in chocolate until I started baking. There’s a world of information out there all about just chocolate. I’m no expert on just chocolate but I do know my basics on it and I will share one important fact. When we see a recipe for a chocolate cake, the most important part it is the type of cocoa you should use in it. 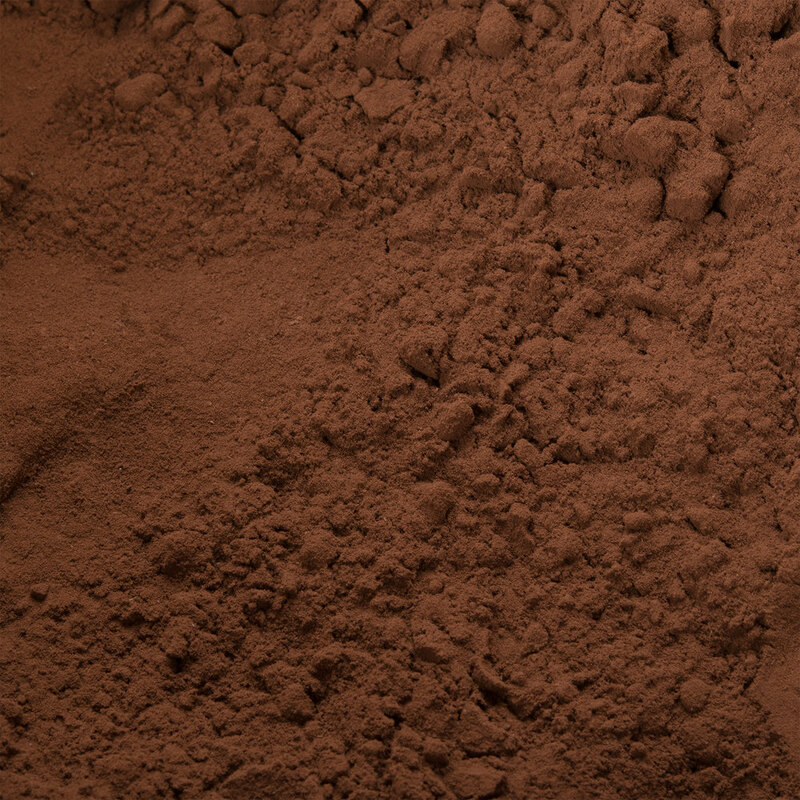 You will find mostly 2 types of cocoa powder. One is called “Natural” and the other one will be “Dutch Processed”. Even though these are the most common ones, there are other types or combos out there that you guys can explore. In the meantime I will explain the difference between these common two. Natural cocoa is solid, unsweetened chocolate that’s had most of its fat removed before being ground into powder. 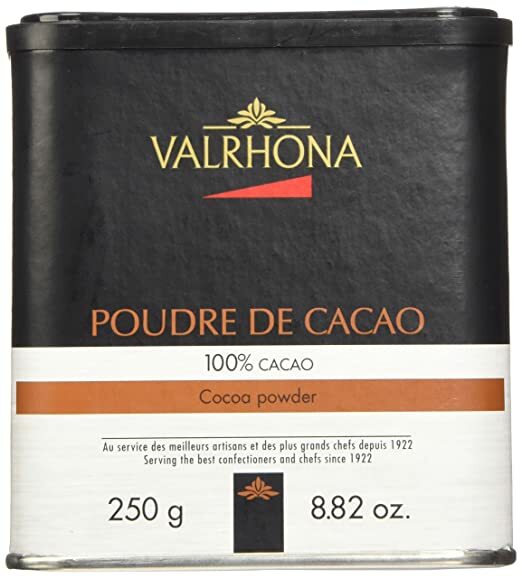 This cocoa powder is typically sold unsweetened, and although it may taste a bit bitter or harsh on its own, it can work well in baked goods that are meant specifically for this type of chocolate. This type of cocoa is consider to give a more drier outcome. Dutch-process cocoa is natural cocoa that’s been treated with an alkalizing agent to lower its acidity. This allows more of its pure chocolate flavor to shine through. 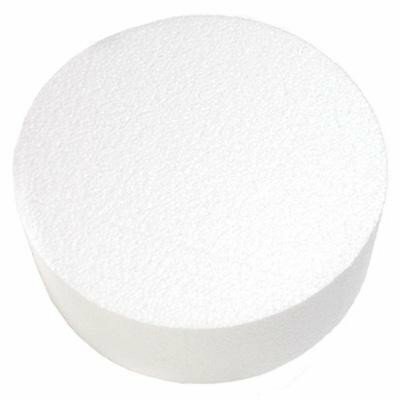 The alkali helps neutralize the natural acidity of the powder. 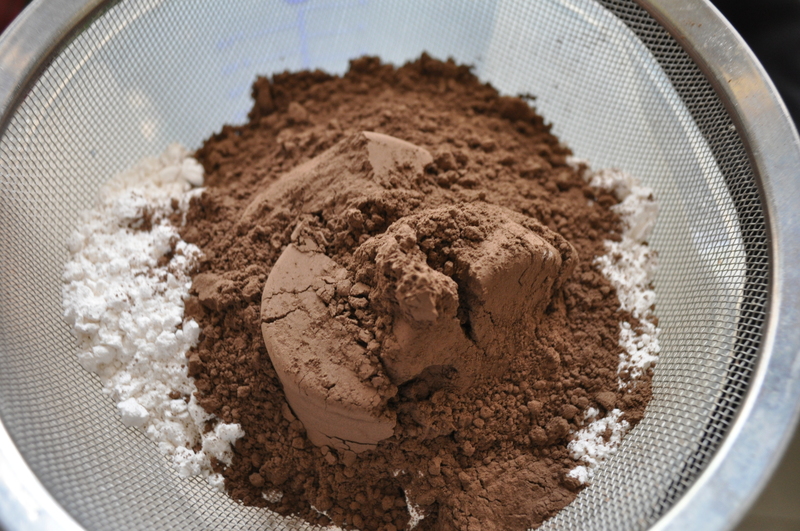 The process gives the cocoa powder a more mellow, smooth and less bitter flavor. This type of cocoa tends to give a more fudgier, moist taste. There’s a lot of science behind which one you can use when it comes to baking a cake. 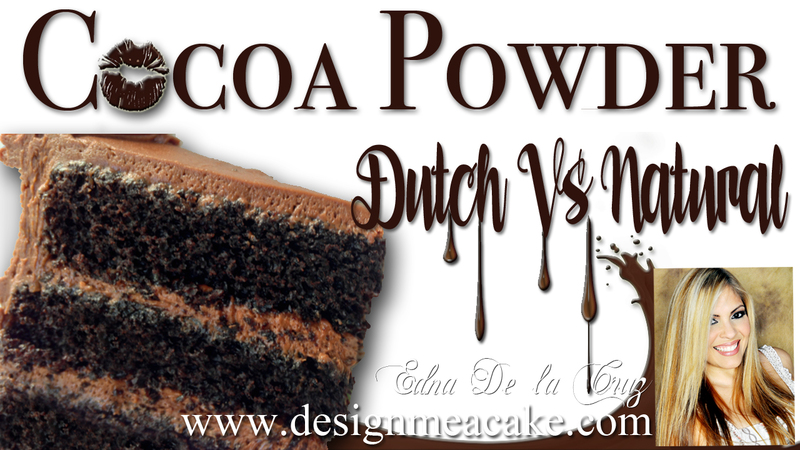 Natural Cocoa and Dutch cocoa are not interchangeable in all recipes. I will simplify by saying this: If a cake recipe only calls for baking soda, it likely uses acidic natural cocoa. If it only uses baking powder, it’ll probably ask for Dutch process cocoa instead. If a recipe calls for both, baking powder and baking soda, you’ll need to follow the recipe to get the proper balance of acid and alkaline. Recipes that use baking powder will likely rise anyways but not as well. So basically it’s best to stick to the cocoa that a recipe calls for. I personally tend to use dutch cocoa if the recipe doesn’t say which kind of chocolate to use. Using the wrong cocoa in your recipe not only can make your cake go flat, but it can also make the flavor of your cake change drastically and you can end up with a cake with a strange or soapy taste. Keep in mind that some recipes have other acidic additions that come into play like buttermilk, fruits, sour cream, vinegars and other acids. I would suggest that when you try a recipe for chocolate cake, make sure to see if there are any specifications for what type of chocolate you should use. If the cake is moist and you like the texture but you don’t like the flavor of it, then try another brand of cocoa. There are many brands out there and everyone has a different idea of what good chocolate should taste like. It’s a very personal opinion. Some people like a stronger flavor while others will prefer a subtle one. Some people like milk chocolate and others like dark and bittersweet. It’s all out there for grabs! There are many options when it comes to chocolate. Check for Black Cocoa, Double Cocoa, Triple Cocoa and others. Some are made with a combination of natural and dutch process chocolates, others are known as heavily-dutch and have a stronger chocolate flavor. Believe me, I could go on until my last name changes to Hershey, but then this blog would be very long. At least you get an idea of what is out there and do more research on the subject. Keep in mind also that cocoa powders have different flavors and some of them contain more fats or starches and this will give you either a more moist cake or drier cake. All of these things are important if you are still trying to find your perfect cacao for your cakes. The whole point behind this blog is to let you guys know that if you have tested a recipe for a chocolate cake and maybe the crumb of the cake was great or it was perfectly moist, but the flavor was a little off, then maybe you need to change your cocoa and test it again. If you are not happy with the crumb of the cake but the recipe has great reviews, maybe you need to try another cocoa. The wrong cocoa can change the crumb and moisture of a cake. Some of the most well known companies are Vahlrona, Callebaut, Guittard and there are others. Hershey’s and Ghirardelli are the most easily found in supermarkets. In a pinch I have used Hershey’s Special Dark (this one combines natural and dutch chocolate in it). 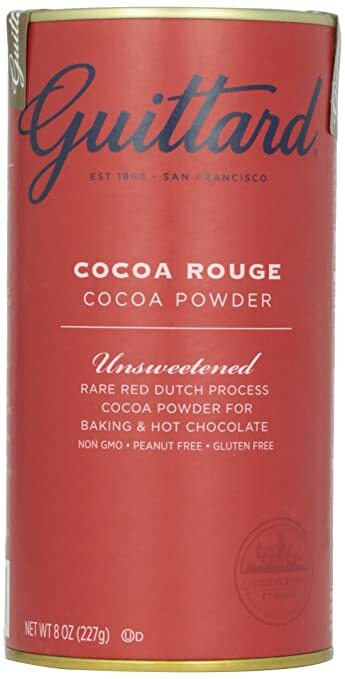 Keep in mind that the other Hershey’s sold is natural cacao so if you have used it in a cake recipe that calls for dutch cacao, then the outcome might not has been the expected one. On the least expensive ones, the Hershey’s Special Dark has a dark (duh) color and pretty decent flavor and I like it a lot better than the original one at least on the cake recipes I have used it in. I will add that I have used the Hershey’s Natural Original and liked the taste better than the Hershey’s Special for the chocolate buttercream recipe I have in my website. Like I said, testing will be your best friend until you find your favorite one. If you happen to be a chocolate snob, then go for the higher quality one. Keep in mind that most of the times you might have to order those online and they have a higher price. For those who are chocolate lovers, sometimes the flavor is worth the extras. My job is not to sell you a specific product but to let you know that there are options. Experiment! 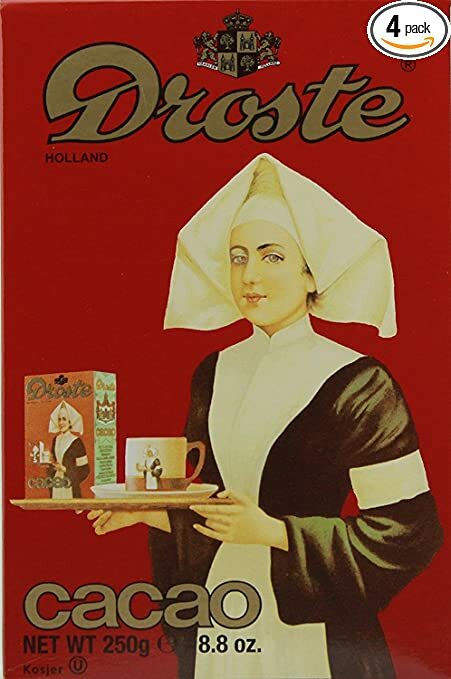 I was sent by a super awesome lady overseas, a cocoa call Droste and it was super delicious. Worth checking it out! I will add that if you get one cocoa that didn’t work for a recipe, this doesn’t mean it’s a bad one. It might just not be the right recipe for that specific cocoa. Test it with other recipes to see how flavor changes and what works best for your tastebuds. Some companies might even have recipes that work well with their own products and that might be worth a try. What is Goop? 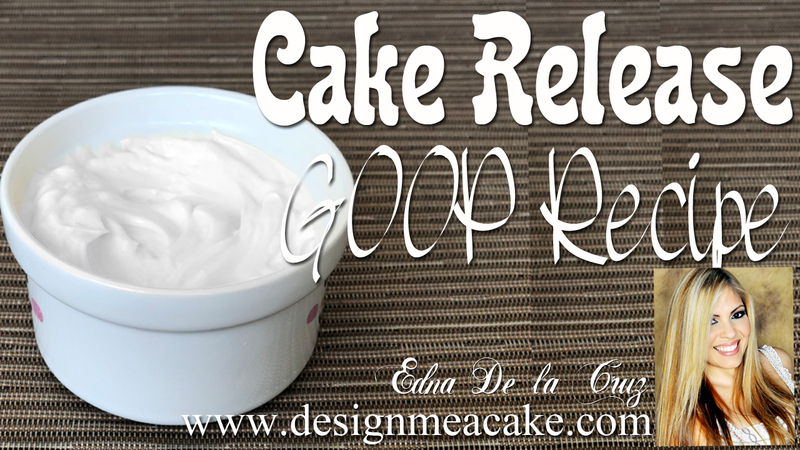 Goop is a cake release mix used for pans so that the cake doesn’t stick to it. I am not sure who created this Goop Recipe but I know is old. I remember years ago working at a custom cake place. The baker had this concoction in a cake pan. She would apply it to the pan and never added flour on top like I used to do when I started baking. That was the way I was taught. You first apply a layer of butter or vegetable shortening and then add a thin layer of flour. I never liked adding the flour because when the cake was done, I had always some of the powder on the cake and I didn’t like how it tasted. Probably I was adding more than I needed back then but we all learn as we go. I decided eventually to ask what they applied to the pan. That’s the first time I heard about Goop. Goop has only 3 ingredients and it’s super easy to make. I get lazy sometimes and use spray on my pans but when I am making a lot of cakes, Goop is the only way to go. I always have the ingredients accessible and I can make as much or as little as I need too. Goop will stay good in a sealed container for around 2 months. I live in a hot and humid area but I always have air conditioner on so if your house is hot, make sure to keep it in a colder area. Oil does get rancid so keep an eye on that. If you smell something funky just throw it and make a fresh batch. If you prefer, you can save it in the fridge. You can use a pastry brush if you have one but if you don’t, use a piece of kitchen paper to spread it around the pan and it should work just fine. Click here to watch the tutorial for Goop and to get the recipe. Until next Blog.. Ta ta! Seems like everyone is getting sick with the flu and there was nowhere to hide from it. But now that I am better I have to catch up with work. Last week I posted in You tube my latest Tutorial on Bas Relief. 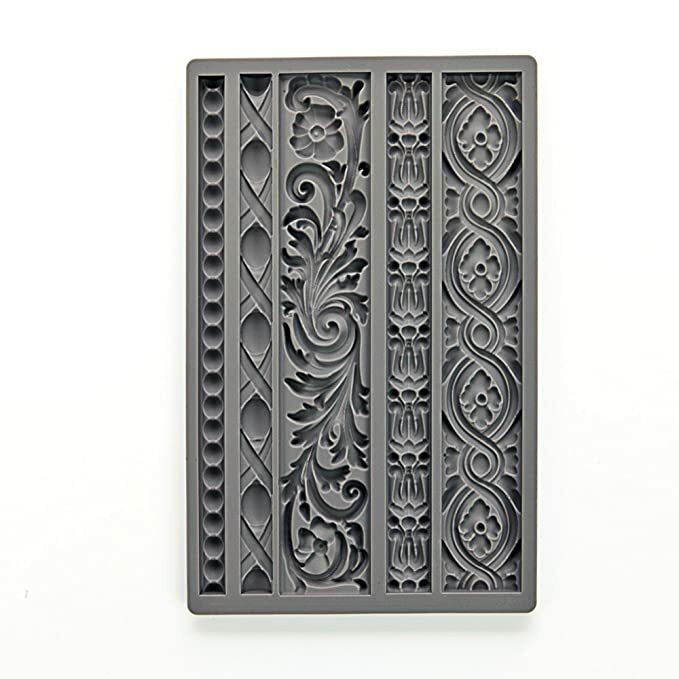 Bas relief is an old technique that is being used a lot these days. Everything old is new again. You can do this technique all over the cake or you can do areas of it. It really depends on what you are trying to achieve. No matter what, it’s a busy look and I can call it even messy when it’s used all over the cake. You can use any mold to do this technique and you can mix them or just be repetitive with the same one. In the tutorial I am using flowers. 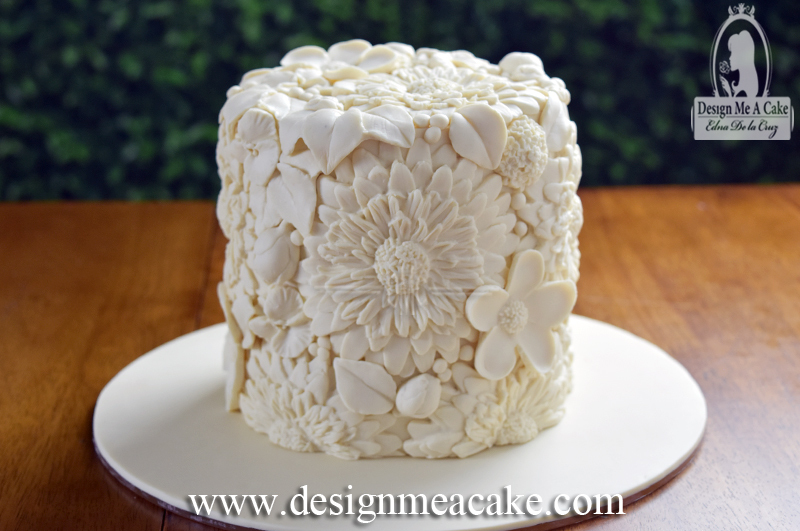 If you use smaller molds it can be more time consuming so I used this mold from Karen Davies collection that has big flowers that can cover a lot of area fast. A whole cake can be covered with this technique. But sometimes just one tier is enough to make a cake stand out. If you plan to cover a whole cake with this technique, make sure to add this to the cost of the cake as it will be time consuming. you can check her website but if you live in USA keep in mind it will be an International order. 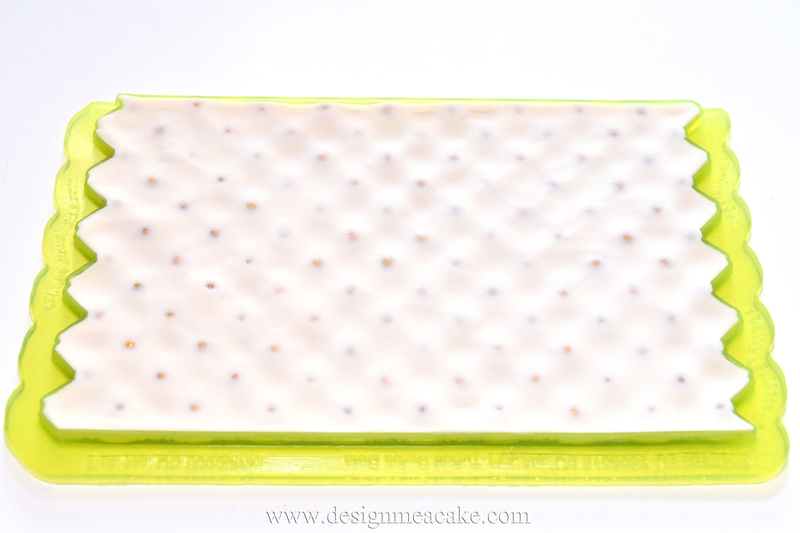 But if you can’t find the mold, there are many options you can use to make this style of cake. The photo to the left shows another beautiful mold that has different flowers that you can use to make this type of garden cake. I will be clear that I am not getting paid to sell these molds. I am just showing you a product that I used and liked. You can also use molds you already have at hand to make this type of cake. I did a 2 tier cake where I show step by step how to decorate the cake and how to make the beautiful bow. I put the tutorial for rent and for sale so you guys can choose what you prefer. I want to do more tutorials but longer tutorials like that are very time consuming and the small amount I am charging will cover the cost of making the longer tutorials. I will still do my You tube tutorials but the advanced tutorials will be including all the steps on how to make a cake. I thought that paying for a tutorial as you want to see it is more convenient than paying a monthly fee and easier on anybody’s pocket. Plus you can choose which tutorials you want to buy. I added more photos of this cake in the website. Click here to check them out. 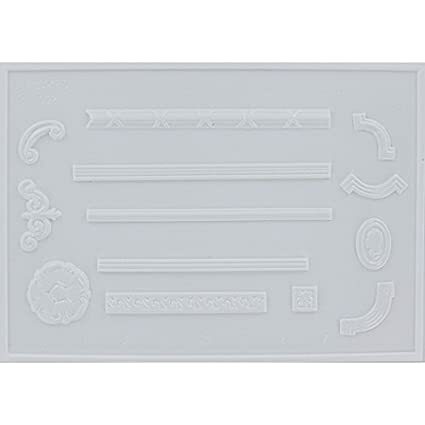 If you want to see the Free You tube Bas Relief Tutorial Click here or on the photo below. 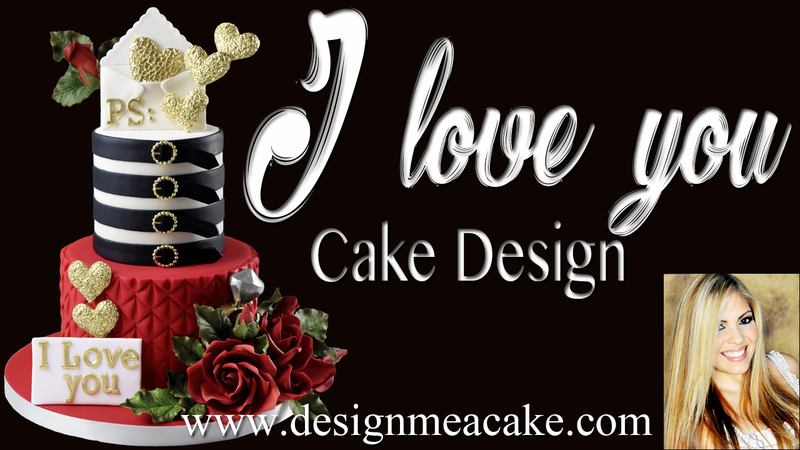 To check the step by step tutorial on how to make the 2 tier Cake Click here or on the photo below. I hope you enjoy these tutorials. Until next one, Ta ta!